Spaghetti squash is a healthy alternative to regular spaghetti. Lower in carbs and full of vitamins and minerals, it’s a far cry from the empty starches inherent in white dough spaghetti. 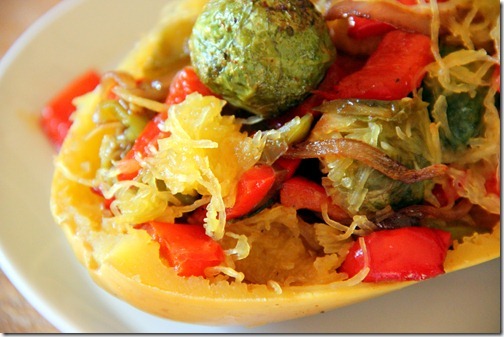 I paired this squash with roasted Brussels sprouts, red pepper, and onions. The result is a hearty, but skinny pasta dish. Enjoy! 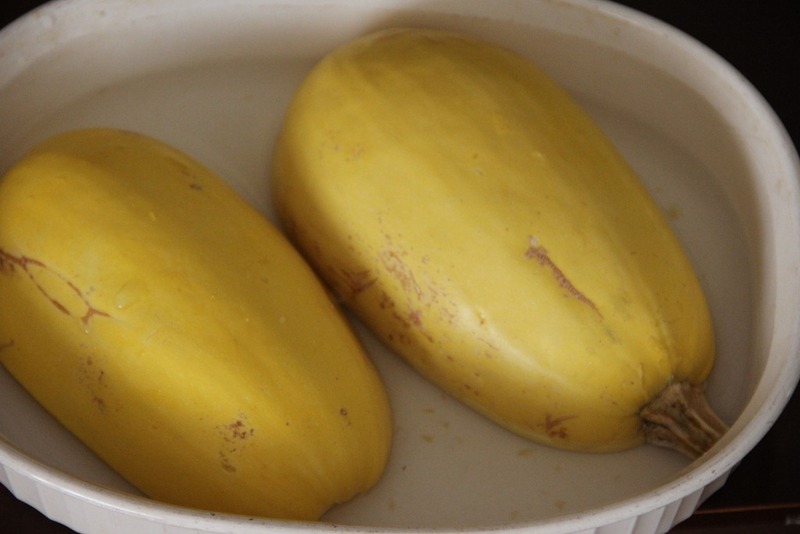 Spaghetti Squash: contains omega-3 fatty acids and omega-6 fatty acids, which are good for preventing heart disease, cancer, inflammation, and brain disorders. It is also great for lowering blood pressure, preventing damage to blood vessel walls, promoting a healthy pregnancy, and preventing cell damage. Preheat the oven at 400 degrees Fahrenheit. 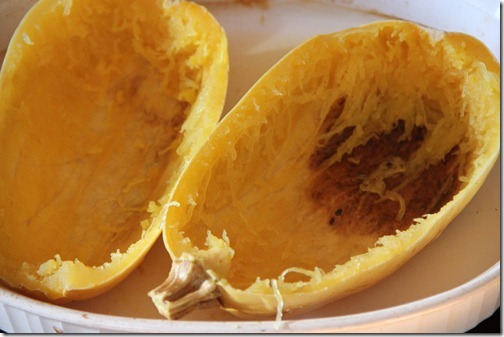 Cut the spaghetti squash in half along its length and remove the seeds and squishy center. Place both halves, face down in a pan with enough water that goes up an inch deep in the dish. 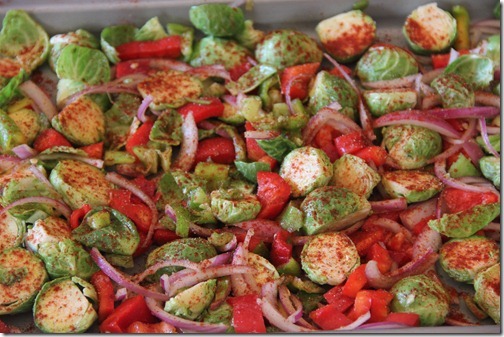 Pop in the oven for 45 minutes until soft. 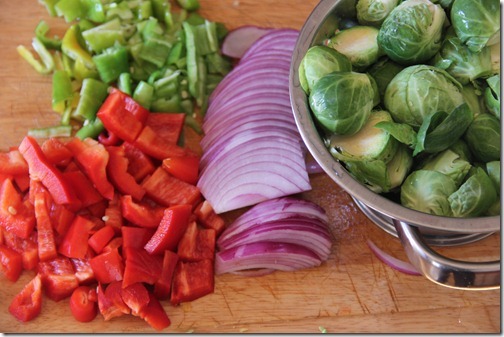 Cut the red pepper, green pepper, and onions. 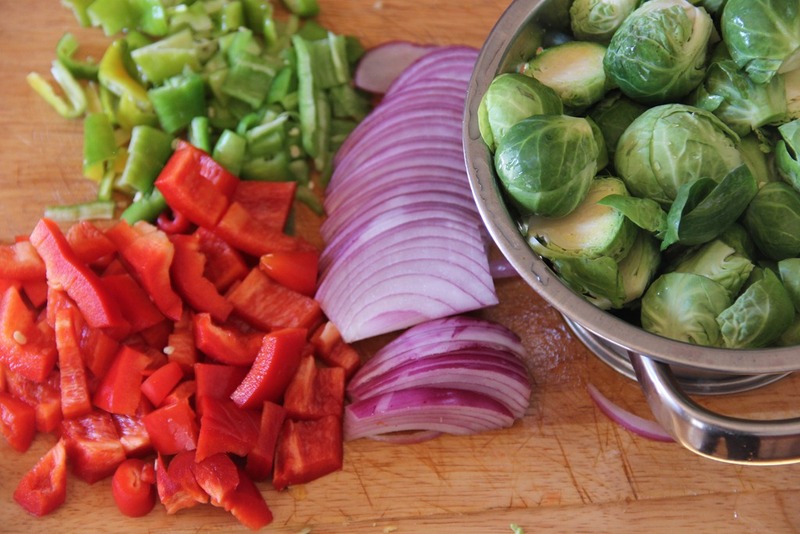 Cut off the rough stems of the Brussels sprouts and slice each in half. 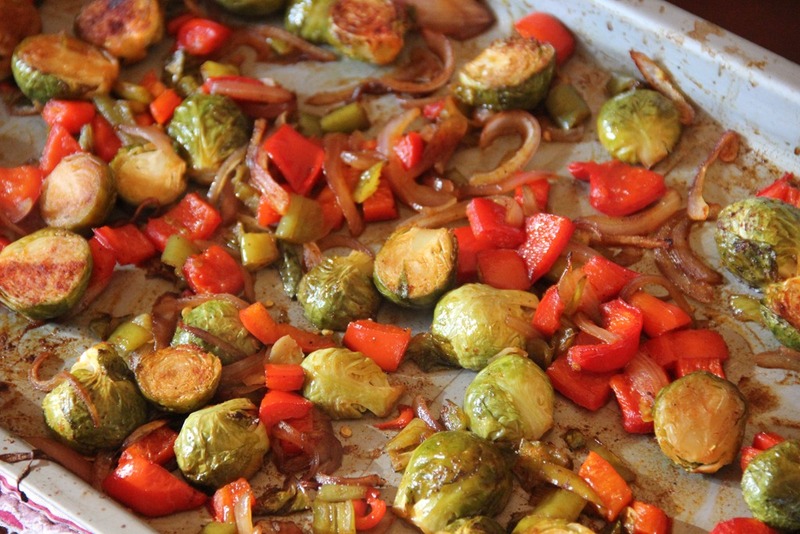 Massage the veggies with the soy sauce, pepper, and paprika. 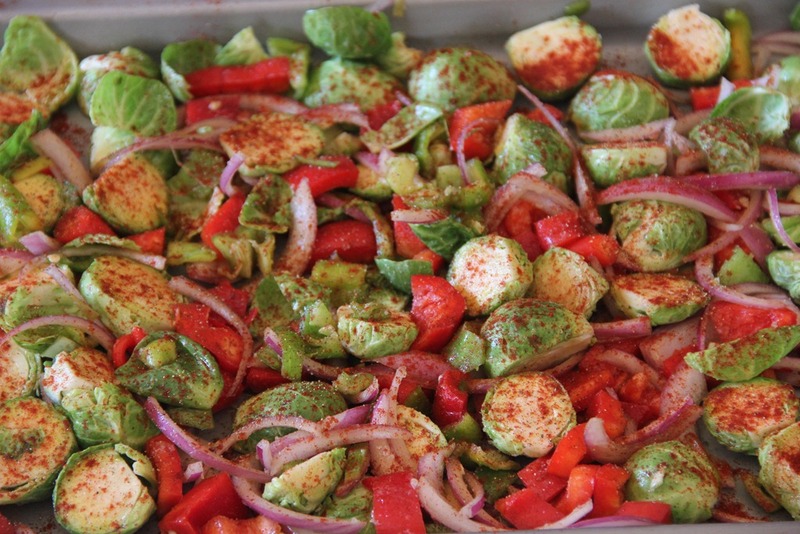 Spread on a baking dish. Pop into the oven with the squash and let cook for 30 minutes until browned. When the spaghetti squash is finished, turn each half over and use a fork to pull at the flesh and scoop out the spaghetti strands. 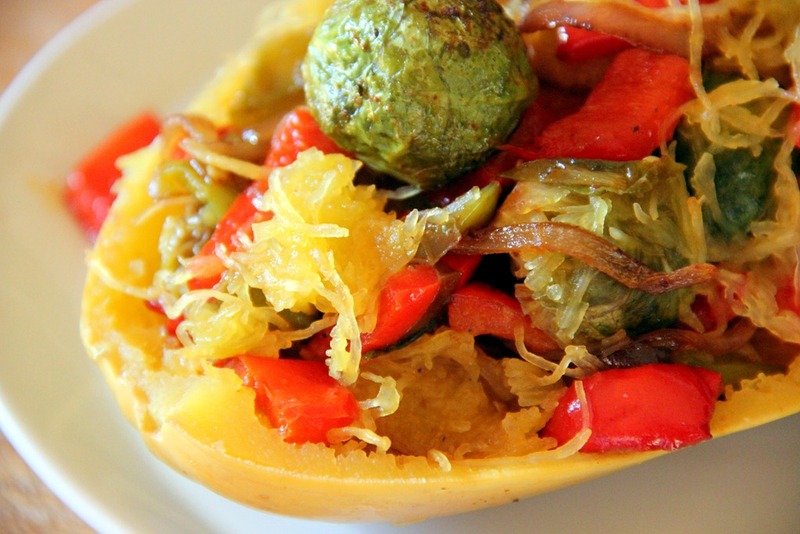 Toss the cooked veggies with the spaghetti and scoop into the squash skin halves. 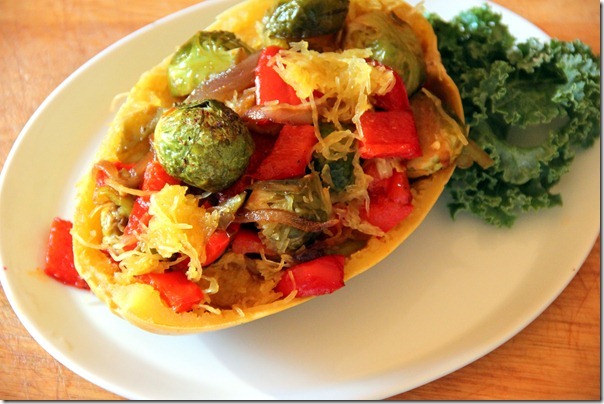 This entry was tagged brussels sprouts, butter, green pepper, pasta, red pepper, soy sauce, spaghetti, spaghetti squash, vegan, vegetarian. Bookmark the permalink. I haven’t had spaghetti squash in far too long! So glad it’s fall and they’re back in season. 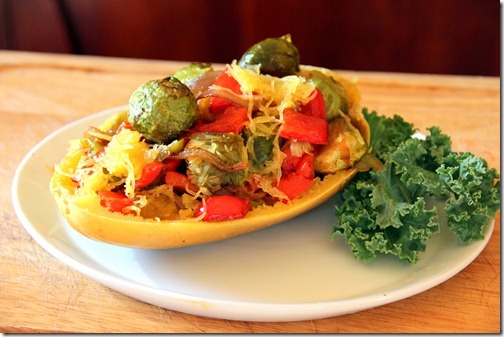 I love the idea of stuffing squash with more vegetables for double vegetable action! 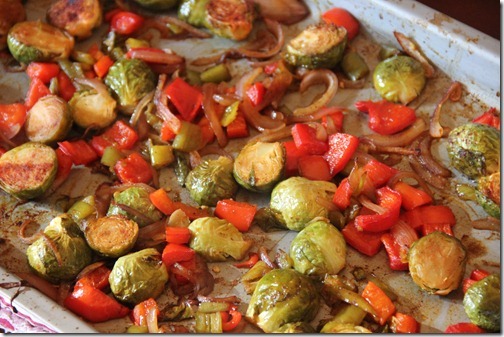 Do the sprouts carmalize when roasted without oil? No they won’t properly. 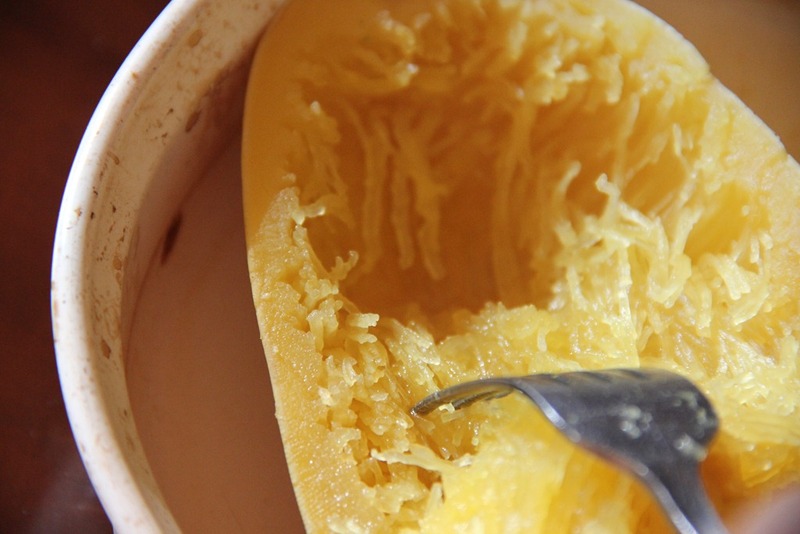 You will either need to add oil or butter or something sugary, like maple syrup or honey.